Panchang has 5 parts. 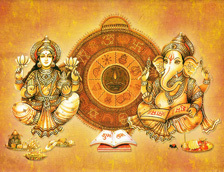 :- Tithi, Vaar, Nakshatra (constellation), Yog and Karan. The auspicious time is known on the basis of these elements. The combinations of these 5 elements give auspicious or inauspicious time. By determination of auspicious time, a Muhurth is decided. 1. Normal Muhurth :- The Muhurth which is not based on Tithi, Vaar, Nakshatra etc is normal Muhurth such as Chaughariya, Abhijit etc. 2. Specific Muhurth :- The Muhurth that requires consideration of sign, nakshatra, tithi, vaar etc of the native is specific Muhurth. Examples: marriage, joining of a job, purchase of a vehicle etc. Muhurth According to your Horoscope.